Even for many realtors, negotiating with a home builder is an unknown. Can you make an offer below list price? Are they willing to negotiate? What concessions, if any, can you ask for? Like any financial negotiation, your ability to negotiate with a builder will depend on economic conditions surrounding your deal. Often, there is not a lot of room for negotiation - the builder knows his costs and he lives in the market day-to-day, so has an accurate understanding of the home’s value in that market. 1. Supply and Demand: Always a major determinant of bargaining power in any negotiation, this will be influenced by overall supply and demand within the market area, but can also be affected by supply and demand within that specific community, and that builder’s overall supply of inventory. 2. Time Pressure: If a builder is in a position to negotiate, a longer time horizon to buy may give you a little stronger bargaining position. 3. Financing: While not as strong of an incentive as many buyers believe, a cash offer may still give you an opportunity to negotiate on a house that is already built and on the market, but is less likely to impact a custom order house. 4. Pre-built Inventory: Because of carrying costs, a builder may be more willing to adjust the price of a house that is already built and in inventory. 5. Be Early in the Community: you have a better chance of negotiating a deal if you are one of the early buyers in a community. 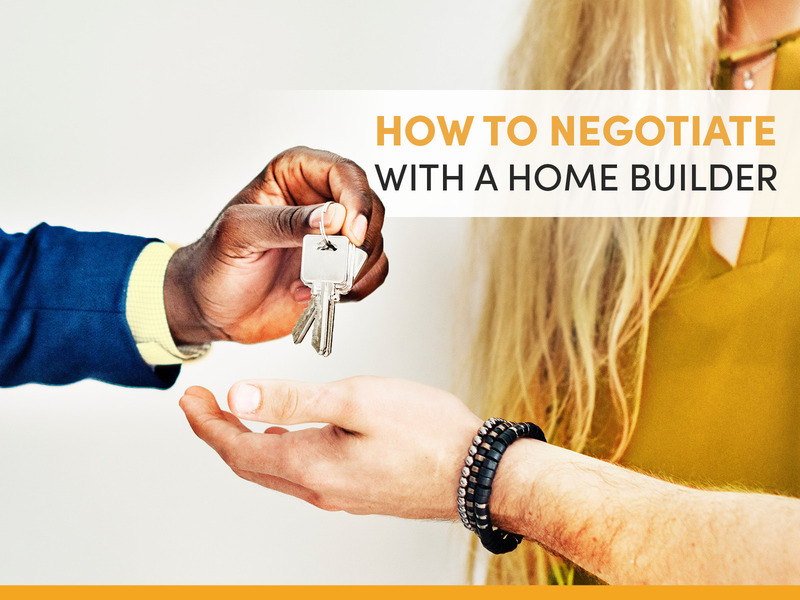 Even when builders do negotiate, they’re often reluctant to negotiate the price of the home as that price will determine the future prices of additional homes they want to sell in the area. Instead, they may offer an upgrade to the house or concessions (furniture, gift cards, etc). If they are willing to negotiate costs, it is more likely to be closing costs - again, so that it doesn’t impact the final sale price of the house. Good luck with your new home search. There are many benefits to owning a new home, let us know if we can help in any way. Visit our website to learn more about our homes.